Gus Van Sant seems to alternate between directing genuinely art-house cinema often with an experimental edge and directing more mainstream fare. It has to be said that RESTLESS is very much in the latter camp, and may well be his most banal film since FINDING FORRESTER. Based on a debut feature film script by playwright Jason Lew, the movie feels like a sort of watered down romance with pretensions to the style and feel of HAROLD & MAUDE or even second-rate Wes Anderson (himself already derivative of H&M). You can't start a film with a lead character obsessively crashing funerals while wearing a three-piece suit and end the film to the sound of Nico without raising eyebrows. If you set aside all that stylistic pilfering what do you get? A wannabe cute romance between two quirky teenagers: Mia Wasikowska's terminally ill Annabel and Henry Hopper's morbid, mournful Enoch. They share a dark sense of humour, they don't quite fit into the world, and run around being kooky. We're meant to care. And then she dies. I just couldn't get into the film at all. I wanted the subversive comedy that the opening references to funerals implied, but which the movie didn't deliver aside from one very funny staged death scene. I wanted the film to make more of it's one genuinely new and good idea - Enoch's imaginary friend, the kamikaze pilot Hiroshi (Ryo). I wanted the movie to tackle the death from cancer with the honesty of Will Reiser's 50/50 but to no avail. I wanted to care, but just plain didn't. I mean, there's something wrong with a movie when you care more about the plight of the hero's imaginary friend than the hero himself. I think the problem here is the script, which once you strip it off its affectations, is pretty banal. The direction, photography and lead performances are just fine. Forgettable, derivative, blah. 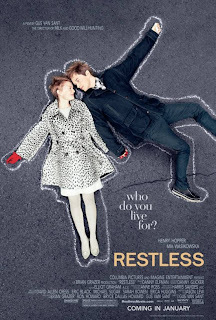 RESTLESS opened earlier this year in Egypt, Malaysia, the Netherlands, Italy, Argentina and France. It played Cannes, Toronto and London. It is currently on release in German, Greece, Russia and Spain and opens on October 21st in Finland and the UK. It opens in Portugal on November 10th; in Sweden on November 25th; in Hong Kong on December 1st and in Japan on December 23rd.